By now you must already be knowing that Lakme has revamped the packaging of their Enrich Satin Lipsticks and also has come up with 10 new shades. If no, then CLICK HERE to know more about it and to see all the 10 swatches. Keep reading to know more about these lipsticks. Packaging ~ Lakme Enrich Satin Lipstick has silver body with a transparent plastic lid and bottom. I am glad that they got rid of their maroon and gold packaging, You can make out the colors from the top of the lid. The lipstick's number is written at the bottom. I wish these lipsticks had sassy names instead of numbers. 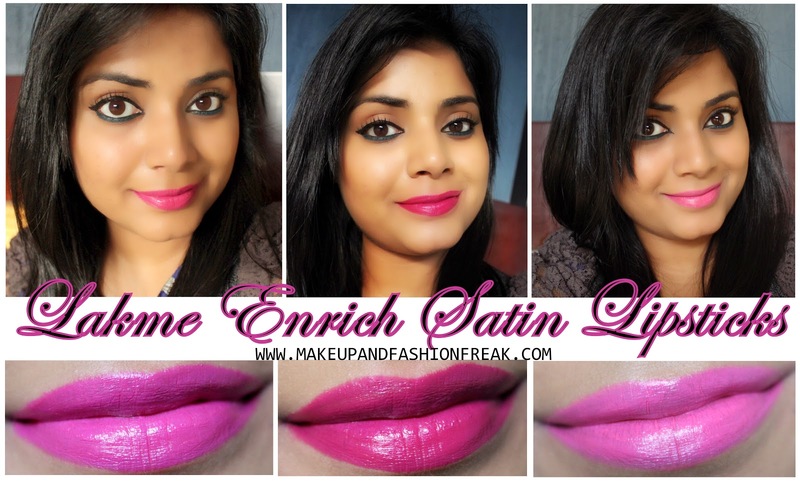 Texture ~ All the Enrich Satin Lipsticks does not have the same texture. Few of them does not apply evenly and looks tacky on lips. P163 and P168 has a smooth texture, glides on easily and applies evenly on lips. They don't feel heavy on lips even if layered. P169 is feels little liquidy while applying. It tends to settle in the fine lines if the lips. Finish ~ The lipstick is creamy and easy to apply and has a Glossy finish. It stays for 5-6 hours. Needs to be re-applied after a meal. Fades evenly and leaves a nice tint behind. The lipstick is does not feel dry and is very moisturizing. Color and Pigmentation ~ All the lipsticks are pigmented and goes opaque in a single swipe. It can be layered easily. Does not look patchy or overdone even if applied again and again. P169 is a gorgeous neon pink. P163 is a pretty purplish pink. P168 is a lovely purple. Fragrance ~ The lipsticks still smell like the old ones and I really hate the smell. Overall, I am in love with the lipsticks sans fragrance. Do try them on before buying because they have different texture.